Please welcome to the stage a master illusionist. An energy beam that stabs out of galaxy M87 like a toothpick in a cocktail olive is pulling off the ultimate magic trick: seeming to move faster than the speed of light. Almost five times faster, in fact, as measured by the Hubble Space Telescope. This feat was first observed in 1995 in galaxy M87, and has been seen in many other galaxies since. It might have you questioning your entire reality. Nothing can break the cosmic speed limit, right? You can’t just flaunt the laws of physics… can you? If you want to just enjoy the illusion from your seat in the audience, stop reading. Otherwise, I welcome you backstage for a look at how the trick works – and how it’s helping astronomers to understand the fate of entire galaxies. 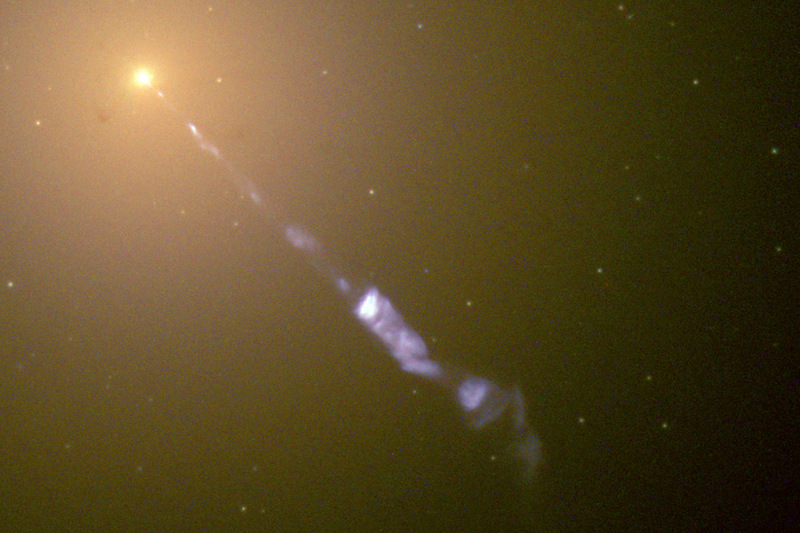 We’ve known about the jet of plasma shooting from the core of M87 since 1918, when astronomer Heber Curtis saw a ray of light connected to the galaxy. 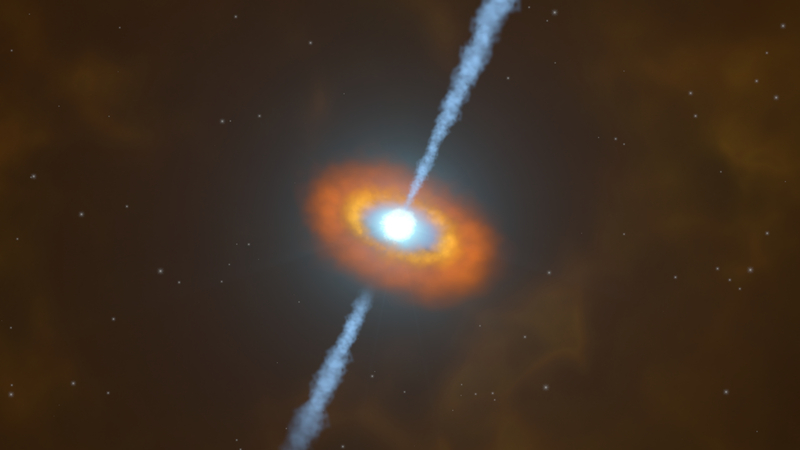 To be visible from so far away, it had to be huge – about 6000 light years long. As modern astronomers now know, pretty much all galaxies have a central black hole that periodically draws in stars and gas clouds. When gas begins to swirl down the drain, it heats up and magnetic fields focus some of it into jets of hot plasma. These jets shoot out at velocities near to – but not faster than – the speed of light. If you were to aim a telescope into the sky towards M87, you would see that this lance of plasma is askew. Instead of pointing exactly into our line of sight, it’s angled a bit to the right. To understand the illusion, picture a single glowing blob of plasma starting at the base of this path and emitting a ray of light, both of which travel towards Earth. Now wait 10 years. In that time, the blob has moved closer at a sizeable fraction of the speed of light. That gives the rays emitted from that later position a few light years’ head start on the way to us. 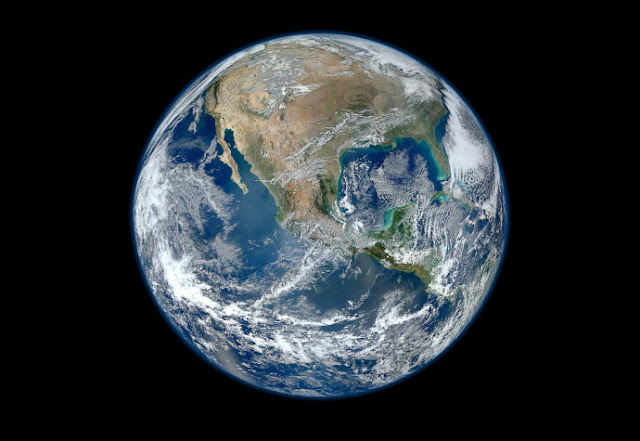 If you compare the first and second images from Earth’s perspective, it looks like the blob has just moved across the sky to the right. But because the second position is also closer to us, its light has had less far to travel than it appears. That means it seems to have arrived there faster than it actually did – as if the blob spent those 10 years travelling at ludicrous speed. The jet from M87 is more than just a curiosity, says Eileen Meyer at the University of Maryland, Baltimore County. All over the universe, outflows of energy from massive black holes can stop or start the formation of stars throughout galaxies. But it’s unclear how these outflows work and how much energy they contain. By appearing to move faster than light, jets such as the M87 one change visibly over just a few years, which is unusual for distant objects like galaxies. That allows astronomers to make precise estimates of how fast the plasma is moving and thus how powerful the process is. 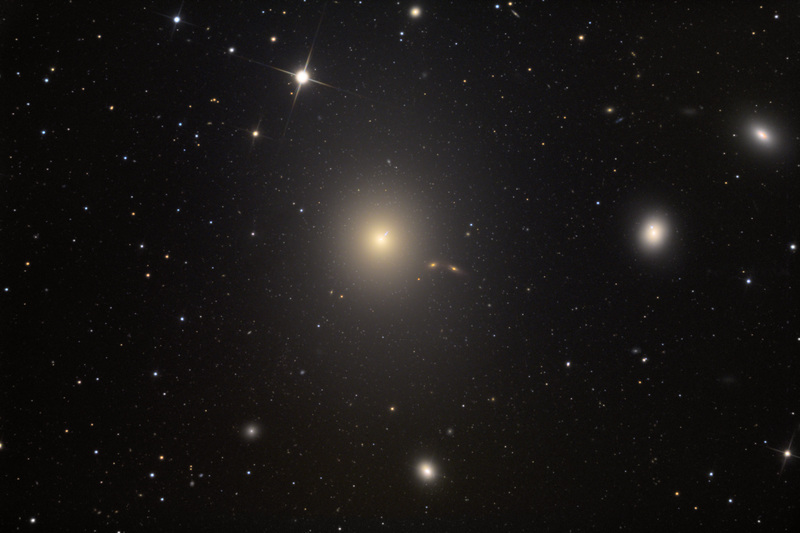 M87 is special because it is relatively close compared to other galaxies, making it easy to study. In 1999, astronomers used Hubble pictures of the jet taken over four years to see that plasma ripple outwards. In 2013, Meyer lengthened that to 13 years of images, which seemed to show that the plasma might also be moving in corkscrew-like spirals – as if it wasn’t complicated enough. Fresh results from Meyer, now being prepared for publication, extend that baseline again to a total of more than two decades and may offer new surprises. “Over 20 years, you know, things go bump in the night,” she says. And although the faster-than-light effect is old hat to her, she still stops to appreciate it sometimes. Most things we see travelling across the sky, such as planets and comets, are close to us. But M87 is tens of millions of light years away.